The wisdom of our ancestors (be it that of our bloodline or of our soul) is often contained within the vibrational element of sound. These words contain not only knowledge, but a deeply ingrained resonance that can alter the listener in even more profound ways. When these words are turned into song – a sacred space is woven around the performer and the listener alike. 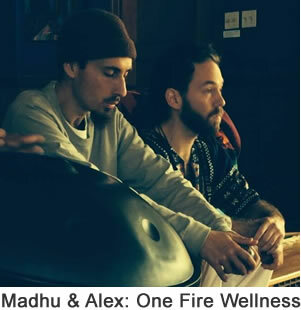 For musical duo, One Fire Wellness, their debut album evolved out of a demand from the community they serve. Trained in the Pachakuti Mesa tradition (originated by Don Oscar Miro-Quesada), shamanic apprentices Alex Kugler and Madhu Anziani began playing their music at new moon and full moon rituals. The songs they sang had such a powerful vibrational effect, that they received requests to turn their collection of songs into an album. Similarly, musicians Miguel Guldimann with Yerpun Solar & Ruth Untoria have released and album entitled Songs of the Plants, a tribute to the sacred songs of the plants in the Amazon. They say their songs were obtained through direct contact with the elements of nature and are used to bring their listeners into better contact and understanding with the elements. Like One Fire Wellness, these musicians speak about their music as medicine. The songs and repetitive notes raise the frequency of the listener and depending on intention, can increase health and promote healing. These traditional Icaros are enhanced by the emotive guitar playing of Miguel Guldimann. A a Swiss-Peruvian musician born in Switzerland and trained in classical guitar he, believes that the songs are as ancient as human existence but are completely relevant in our modern world. The three weave the traditional sounds of the forest with classical guitar and state of the art production quality to produce an album which was nearly three years in the making. Both albums immediately evoke a feeling of sacred space and can facilitate deep healing experiences when used in ceremony. But ceremony is not a prerequisite to enjoy this music – the music of both albums can imbue even the most mundane tasks with an element of the divine. The post HOW MUSIC TRANSFORMS OUR WORLD appeared first on Shamans Market.